Analyzing RF pulses is a key aspect of pulsed radar applications, e.g. in air traffic control (ATC), maritime radar or scientific measurements of the ionosphere. Analyzing the modulation of the pulse is essential, because it contains important information to characterize the application. 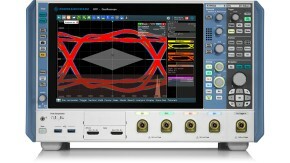 The R&S®RTO and R&S®RTP oscilloscopes can precisely trigger on and analyze RF pulses. This document describes the use of the R&S®RTO and R&S®RTP to demodulate RF pulses for further measurements. You have to measure radar RF pulses with respect to frequency, modulation type (linear up/down, exponential, phase) chirp rate, modulation sequence, pulse repetition interval (PRI) and amplitude to judge if they fulfill your requirements 1). So you need to trigger on a pulse in a reproducible manner to position the pulse correctly for the measurements. Once triggered, you can demodulate the pulses, which are either frequency modulated or phase modulated. 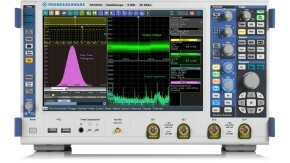 The R&S®RTO and R&S®RTP oscilloscopes can analyze RF pulses with frequencies up to 6 GHz/8 GHz. The most important feature for pulse analysis is the digital trigger. Compared to an analog trigger, the digital trigger has much better trigger sensitivity and no bandwidth limitation for an advanced trigger type. To analyze the RF pulse, the trigger must always appear in the same position relative to the pulse. As an example, a pulse train is used with a pulse duration of 25 μs and a PRI of 50 μs (see screenshot below). A zoom shows the third pulse in greater detail at the trigger position (t = 0 s). For this acquisition, a width trigger is used. The trigger setup (Trigger on radar RF pulses with an oscilloscope - Application card, PD 3609.2000.92 Rohde & Schwarz GmbH & Co. KG) and envelope analysis (Analyzing RF radar pulses with an oscilloscope - Application card, PD 5215.4781.92, Rohde & Schwarz GmbH & Co. KG) are described in separate documents. 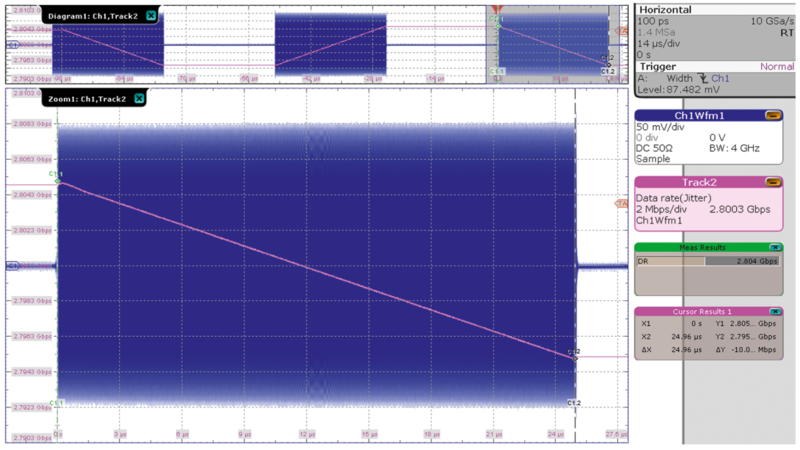 The horizontal scale is set to 14 μs/div so that three pulses are captured to analyze the modulation sequence. Now, the pulse is demodulated. The example pulse train is frequency modulated and is demodulated using one of the oscilloscope’s automated frequency measurements. Using this measurement together with the track functionality, frequency results are displayed as a function of time. This approach works well for wideband radar signals such as automotive radars. For narrowband signals such as ATC radars where the carrier frequency is large relative to the occupied bandwidth (fC >> fB), the track function looks quite noisy. This noise limits the accuracy of the chirp rate measurement and requires additional noise reduction. The noise reduction of the signal is not straightforward. A simple bandpass filter cannot be used due to the changing carrier frequency. The filter bandwidth must be quite large. In a conventional, coherent radar system, the RX and TX paths share a stabilized local oscillator. For an oscilloscope, downconversion with the local TX oscillator is impossible because this signal is unavailable. Utilizing a phase locked loop (PLL) 1) to demodulate the signal is another approach. The R&S®RTO and R&S®RTP oscilloscopes have a software- based clock data recovery (CDR) that is equivalent to a PLL. Using the automated measurement function, the data rate essentially measures the instantaneous frequency of the pulse. 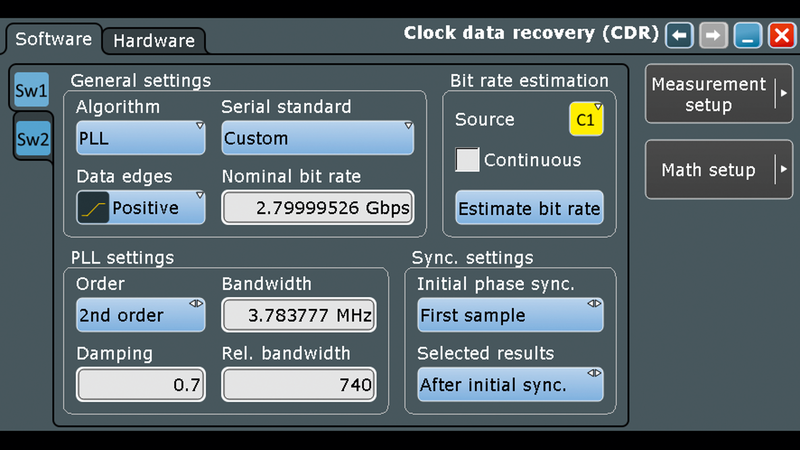 When the track function of the data rate is turned on, the instantaneous frequency is displayed over time (see Track 2 on the right side of the first screenshot). Due to the use of the data rate function, the vertical unit of the displayed track is gigabit per second (Gbps), which is equivalent to GHz since the bit period and the sine period are the same. Diagram 1 (upper section of the first screenshot) shows the modulation sequence of down-updown chirps within the pulse train of three pulses. For a more detailed analysis, the cursor on the track in the zoom window can be used to measure the chirp rate. This measures the frequency change of the pulse over time. For the given example, Cursor Results 1 (lower right of the first screenshot) shows 10 MHz in 25 μs for the down chirp. The data rate function requires the CDR configuration. The screenshot above shows the CDR menu, where the algorithm is set to PLL, and the data edges are set to positive edges. Define the order of the PLL as second order since only a second order PLL will display the correct time track of the frequency 1) with respect to the data rate. Estimating the bit rate will set the nominal bit rate to the expected value. The damping factor and the sync settings do not need to be modified. The bandwidth is important only for the measurement. The PLL bandwidth allows a tradeoff between the visible noise and the settling time for the initial pulse. A large bandwidth settles fast but will not attenuate the noise efficiently, whereas a small bandwidth will efficiently attenuate the noise on the track but takes more time to settle. With the displayed PLL bandwidth setting of 3.8 MHz, the noise is barely visible on the track and the effect of settling is minimal, which improves the accuracy of the chirp rate measurement. The R&S®RTO and R&S®RTP oscilloscopes analyze RF pulses to the maximum bandwidth of the used model. To perform a detailed analysis, the R&S®RTO and R&S®RTP trigger precisely on the pulse. The stable captured waveform can be demodulated to analyze important characteristics such as modulation sequence and chirp rate. The R&S®RTO and R&S®RTP can also accurately characterize the pulse envelope (Analyzing RF radar pulses with an oscilloscope - Application card, PD 5215.4781.92, Rohde & Schwarz GmbH & Co. KG).